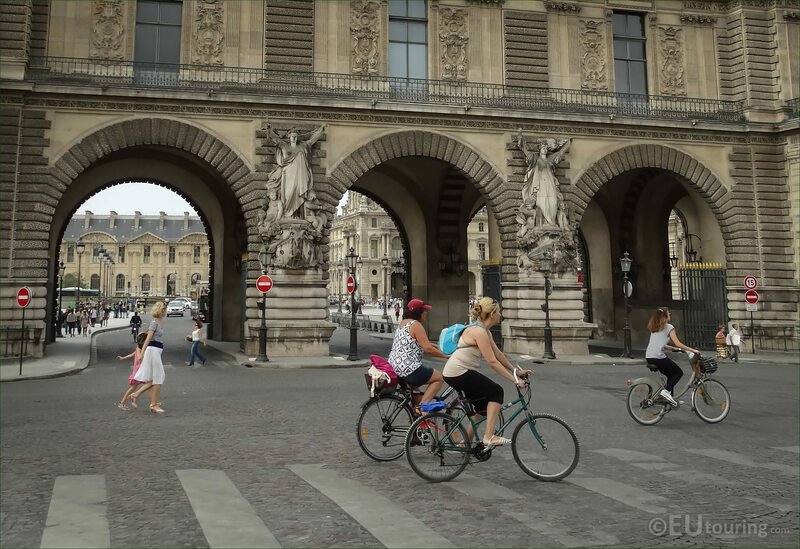 We were in the 1st Arrondissement of Paris at the Musee du Louvre when we took these high definition photos showing a statue called Marine Guerriere, which is located on the Guichets Lesdiguieres section of this former royal palace and was sculpted by Francois Jouffroy. 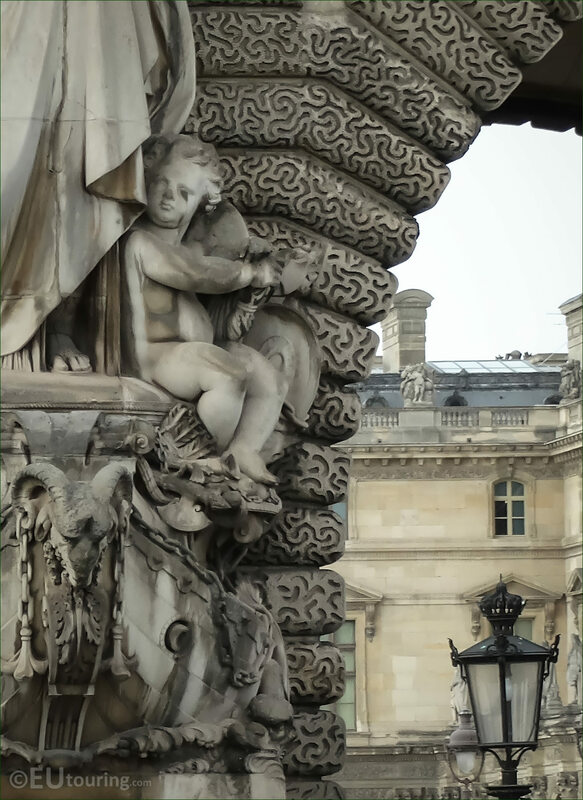 This first HD photo shows the allegorical statue located on a section of the former Palais du Louvre known as the Guichets Lesdiguieres and in French the name of this sculpture is Marine Guerriere, which in English translates to Marine Warrior, however, it is also sometimes referred to as Naval Power, and although this wing is classed as a part of the Cour du Carrousel, it faces the River Seine. 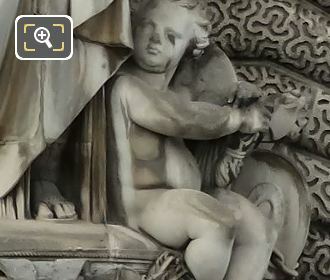 Now this next close up photograph shows a young child sitting next to a shield holding a weapon, and this is just a small part of the statue group produced by Francois Jouffroy, who was born in Dijon in 1806 and after entering a drawing school in his home town he managed to get a grant to go to Paris where he entered the Ecole des Beaux Arts in 1824. 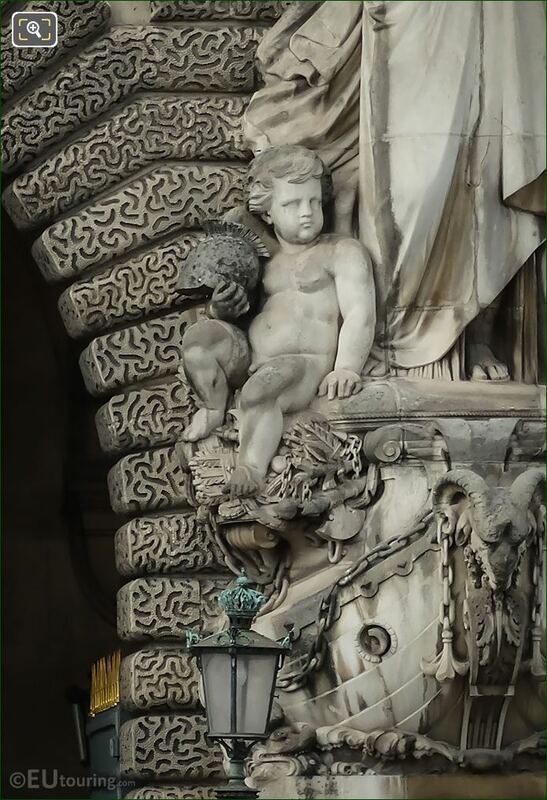 Yet this next close up photograph shows the other young boy located on the left hand side of the allegorical statue group Marine Guerriere, and as you can see, he is sitting holding a helmet, which is just another part of this allegory depicting Marine Warrior or Naval Power. However, Francois Jouffroy become such a renowned French sculptor, especially after winning the Prix de Rome, that he received numerous commissions for works on public buildings during the Second Empire. 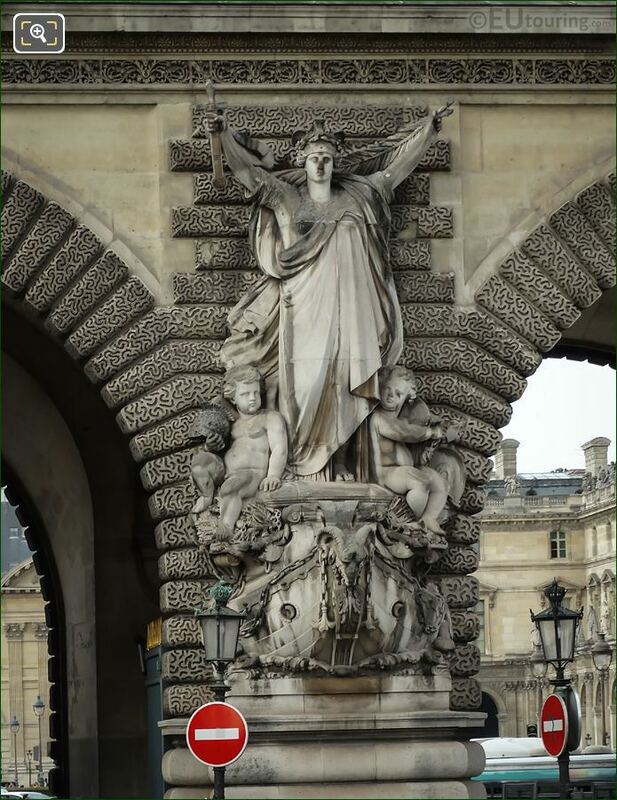 This was when additional embellishments were being added all over the city, and his works can be seen in places such as the Explorer gardens, on the Palais Garnier, the Palais de Justice and several at the Chateau de Versailles, etc. And Francois Jouffroy also produced the statue opposite called Marine Merchant, or Marine Commerce to accompany this one of the Marine Warrior, which you can see in this HD photo, along with several others for the Musee du Louvre during the 1840s through to the 1860s. Yet he also became a professor at the Ecole des Beaux Arts in 1864, teaching many budding artists right through until he passed away in 1882. But this last image also shows the location of the Marine Guerriere sculpture, which as we mentioned earlier faces the River Seine along with the bridge called the Pont du Carrousel, but we took this high definition photo also looking through the archways to the Cour du Carrousel courtyard of this famous tourist attraction in Paris, which receives millions of visitors every year.